For other uses, see Oklahoma (disambiguation). Oklahoma (pronounced /ˌoʊkləˈhoʊmə/) is a state that is in the southern part of the Central United States. It had a population of about 3,751,351 people in 2010. The state has a land area of about 68,667 sq mi (177,847 km2). Oklahoma is the 28th largest state by population and the 20th largest state by area. The name of the state comes from the Choctaw words okla and humma. It means "Red People". It is also known by its nickname, The Sooner State. The state was formed from Indian Territory on November 16, 1907. It was the 46th state to become part of the United States. The people who live in the state are known as Oklahomans or Okies. The state's capital and largest city is Oklahoma City. Oklahoma has only been a state for a little over a century, but its history is much longer. Arrow heads from the Clovis culture, Native Americans who traveled through Oklahoma have been found near the city Anadarko. These arrow heads are about 11,000 years old. The Spiro Mound Building Indians were the state's first permanent settlers. In 1541 the Spanish explorer Coranado traveled through Oklahoma while in search of the Lost City of Gold. During the 1830s, the Five Civilized Tribes were forced to move from the southeastern United States to Indian Territory (now Oklahoma) on the Trail of Tears. During the American Civil War (1861–1865), several Indian tribes sided with the Confederacy. The tribes owned slaves. They agreed with the ideas of the states that seceded from the United States. Also, the tribes were not happy that the federal government did not do what it told them it would do. Not all the tribes sided with the Confederacy. Some tribes had taken control of several forts. This caused much of the Indian Territory to be under Confederate control, but Oklahoma did not become a Confederate state. The Battle of Honey Springs near Fort Gibson on July 17, 1863 was won by the Union forces. This ended the Confederate control of Indian Territory. On April 22, 1890, the western part of the state was opened to almost 50,000 settlers for the Oklahoma Land Run. During this land run Oklahoma got its nickname, "The Sooner State". The nickname came from the settlers who crossed the territory's borders before the land was opened by the government. A year later, the western part of the territory was turned into Oklahoma territory. The northeastern part, which was home to the Five Civilized Tribes, stayed under the control of the tribes. On November 16, 1907, the western and eastern territories joined together. They became the 46th state of the United States. The newly formed state became an important place for the oil industry. The oil pools in the area caused the population of towns to grow very quickly. Tulsa became known as the "Oil Capital of the World" for most of the 20th century. The oil was a large part of the state's early economy. In 1927, Tulsa businessman Cyrus Avery, known as the "Father of Route 66", began a movement to make U.S. Route 66. Avery used section of highway that was already built between Tulsa and Amarillo, Texas to make the original portion of Highway 66. He was the main person responsible for making the U.S. Highway 66 Association to watch over the building of Route 66. During the 1930s, northwestern Oklahoma went through a period of time called the Dust Bowl. The area had little rainfall and high temperatures. This caused thousands of farmers to go into poverty and forced them to move to other parts of the United States. From 1930 to 1950, the state saw its only loss in population. It lost 6.9 percent of the people who lived there. Because of the Dust Bowl, the state made hundreds of reservoirs and man-made lakes. By the 1960s, more than 200 man-made lakes had been made. This is the most in the United States. The song Oklahoma! was made the official song of the state in 1953. The song comes from the 1943 Broadway musical play Oklahoma!. The story is set in Oklahoma Territory in 1906 just before Oklahoma became a state. On April 19, 1995, the Alfred P. Murrah Federal Building in Oklahoma City was bombed by Timothy McVeigh. 168 people were killed in the bombing. This was the worst terrorism attack in the United States before the World Trade Center attacks on September 11, 2001. McVeigh and his partner, Terry Nichols, were both convicted of the bombing. Some people think other people were involved. McVeigh was later sentenced to death and executed by lethal injection on June 11, 2001. His partner, Nichols, was convicted of 161 counts of first degree murder. Nichols is spending the rest of his life in prison without the chance of being released. The name Oklahoma comes from the Choctaw phrase okla humma. This means red (humma) people (okla). Choctaw Chief Allen Wright gave it that name in 1866 during treaty talks with the federal government about the use of Indian Territory. He dreamed of an all-Indian state with power held by the United States Superintendent of Indian Affairs. Okla humma was a phrase in the Choctaw language that meant the same as the English word Indian. It was used to describe the Native American people all together. Oklahoma later became the de facto name for Oklahoma Territory. It was officially accepted in 1890, two years after the area was opened to white settlers. Oklahoma is the 20th-largest state in the United States. It covers an area of 69,899 sq mi (181,038 km2) (68,603 sq mi (177,681 km2) are land and 1,296 sq mi (3,357 km2) are water). The state is shaped like a pan with a long, thin section on the west side. This section, known as the Panhandle, is 165 miles (266 km) from west to east, and 34 miles (55 km) from north to south. It is one of six states on the Frontier Strip. The state is partly in the Great Plains near the center of the 48 continental states. It shares borders with Arkansas, Missouri, Kansas, Colorado, New Mexico, and Texas. The highest point in the state is the Black Mesa, in the Panhandle at 4,973 ft (1,516 m). The lowest point is Little River east of Idabel in the southeast part of the state at 289 ft (88 m) above sea level. There are four mountain ranges in Oklahoma. They are the Ouachita, Arbuckle, Wichita and Kiamichi ranges. All of the ranges are in the southern part of the state. Forests make up about 24 percent of the state. The state is also known for having more man-made lakes than any other state in the country. These lakes cover more than 1,000,000 acres (404,686 ha) with water. By the start of the 21st century, conservative Republicans are the growing force in Oklahoma, but Democrats are still a major factor in statewide politics. In 2006, the incumbent Democrat governor won re-election by 66% over a former Republican Congressman. Despite the landslide victory for the Democrats, the Republicans gained two seats in the State Senate, making a 24 Democrat, 24 Republican tie in the senate, and increased their lead in the house of 57-44. Oklahoma is in a temperate area of the country. The state sometimes sees extreme temperatures and rain that is commonly found in a continental climate. All of the state frequently has temperatures above 100 °F (38 °C) or below 0 °F (−18 °C). It snows in Oklahoma. In the northwest near the Colorado border, the area can get nearly 30 in (76 cm) in snowfall during the winter. The southeastern part of the state usually gets less than 2 in (5 cm) in snowfall. Most of the state is in an area known as Tornado Alley. This is because there is a lot of contact between cold and warm air masses which makes severe weather. Oklahoma has an average of 54 tornadoes each year. This is one of the highest rates in the world. The state is home to the National Storm Prediction Center of the National Weather Service, in Norman. Oklahoma City is the state's capital and largest city by population and land area. Oklahoma had 549 populated places in 2006. It had three cities over 100,000 in population and 40 over 10,000. Two of the fifty largest cities in the United States are in Oklahoma. They are Oklahoma City and Tulsa. More than half of Oklahomans (58%) live in the two cities. Oklahoma City is the state's capital and largest city. It had 1,269,907 people living inside its metropolitan area in 2008. Tulsa, the second largest city, had a metropolitan area population of 905,755. Between 2005 and 2006, the Tulsa suburbs of Jenks, Bixby, and Owasso had the biggest population growth in the state. The population of Jenks grew by 47.9%, Bixby grew by 44.56%, and Owasso grew by 34.31%. Oklahoma's largest cities in 2007 were: Oklahoma City (547,274), Tulsa (384,037), Norman (106,707), Lawton (91,568), Broken Arrow (90,714), Edmond (78,226), Midwest City (55,935), and Moore (51,106). Seven of the state's ten largest cities are in the metropolitan areas of Oklahoma City and Tulsa. Only Lawton has a metropolitan area of its own. Oklahoma law says that populated areas are divided into two groups. Cities are areas with more than 1,000 people. Towns have fewer than 1,000 people. Both have legislative, judicial, and public power inside their populated areas. Cities can choose between a mayor-council, council-manager, or strong mayor form of government. Towns are run through an elected officer system. Oklahoma has minor league sports teams in basketball, football, arena football, baseball, soccer, and ice hockey. These teams are in Oklahoma City, Tulsa, Enid and Lawton. Tulsa is home to the Tulsa 66ers. They are part the NBA Development League. The Tulsa Revolution, playing in the American Indoor Soccer League, is also in Tulsa. The NBA's New Orleans Hornets became the first major league sports team to play in Oklahoma. This happened after the team was forced to move to the Ford Center in Oklahoma City for two seasons after Hurricane Katrina in 2005. In July 2008, the Seattle SuperSonics moved to Oklahoma City. They play their home games at the Ford Center under the new team name, Oklahoma City Thunder. They are the state's first permanent major league team. Oklahoma's state symbols are recognized by state law. The Oklahoma Senate or House of Representatives may add others for special events and to help organizations. ↑ "Keetoowah Cherokee is the Official Language of the UKB" (PDF). Keetoowah Cherokee News: Official Publication of the United Keetoowah Band of Cherokee Indians in Oklahoma. April 2009. Archived from the original (PDF) on July 15, 2014. Retrieved June 1, 2014. ↑ "UKB Constitution and By-Laws in the Keetoowah Cherokee Language" (PDF). United Keetoowah Band of Cherokee Indians in Oklahoma. Archived from the original (PDF) on February 1, 2016. Retrieved July 6, 2017. ↑ "The Cherokee Nation & its Language" (PDF). University of Minnesota: Center for Advanced Research on Language Acquisition. 2008. Retrieved May 22, 2014. ↑ "Oklahoma: Population estimates". U.S. Census Bureau. July 1, 2017. Retrieved May 6, 2017. ↑ 6.0 6.1 "Elevations and Distances in the United States". United States Geological Survey. 2001. Archived from the original on October 15, 2011. Retrieved October 24, 2011. ↑ "Oklahoma State Amphibian - Bullfrog". State Symbols USA. Retrieved March 27, 2018. ↑ 9.0 9.1 "Oklahoma State Icons". Oklahoma Department of Libraries. Archived from the original on January 15, 2014. Retrieved May 11, 2007. ↑ "Oklahoma State Fish - White Bass". State Symbols USA. Retrieved March 27, 2018. ↑ "Oklahoma State Animal - Buffalo". State Symbols USA. Retrieved March 27, 2018. ↑ "Oklahoma State Beverage - Milk". State Symbols USA. Retrieved March 27, 2018. ↑ "Oklahoma State Dinosaur - Acrocanthosaurus atokensis". State Symbols USA. Retrieved March 27, 2018. ↑ "Oklahoma State Fossil". State fossils. Archived from the original on February 20, 2007. Retrieved January 20, 2007. ↑ "Oklahoma State Percussive Instrument - Drum". State Symbols USA. Retrieved March 27, 2018. ↑ "Oklahoma State Cartoon Character - Gusty". State Symbols USA. Retrieved March 27, 2018. 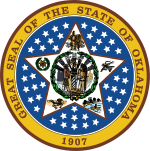 ↑ "Oklahoma State Symbols and Emblems – Complete list of Oklahoma state symbols including the state flag and state seal from NETSTATE.COM". Netstate.com. Retrieved November 18, 2015. ↑ "Watermelon State Vegetable". State Symbols USA. Retrieved June 3, 2016. ↑ Matthew Weaver. "It's a scandal: Oklahoma declares watermelon a vegetable". the Guardian. ↑ "Oklahoma State Game Bird - Wild Turkey". State Symbols USA. Retrieved March 27, 2018. ↑ "Oklahoma State Monument - Golden Driller". State Symbols USA. Retrieved March 27, 2018. ↑ "Oklahoma State Theater Group - Lynn Riggs Players of Oklahoma". State Symbols USA. Retrieved March 27, 2018. ↑ "New Oklahoma Quarter Launches into History". United States Mint. Retrieved February 9, 2008. ↑ "Oklahoma - Definitions from Dictionary.com". Dictionary.com. Retrieved 2008-09-15. 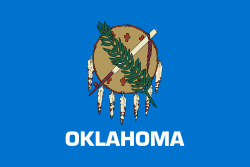 ↑ "Oklahoma QuickFacts from the US Census Bureau". State & County QuickFacts. U.S. Census Bureau. 2006-01-12. Retrieved 2008-09-15. ↑ 28.0 28.1 Wright, Muriel (June 1936). "Chronicles of Oklahoma". Oklahoma State University. Retrieved 2008-09-15. ↑ "Oklahoma at a Glance" (PDF). Oklahoma Department of Commerce. Retrieved 2008-09-15. ↑ "State Personal Income 2006". United States Department of Commerce. 2007-03-27. Retrieved 2008-09-15. ↑ "Gross Domestic Product by State (2005-2006)" (PDF). Oklahoma Department of Commerce. Retrieved 2008-09-15. ↑ 32.0 32.1 "Annual Estimates of the Population of Metropolitan and Micropolitan Statistical Areas: April 1, 2000 to July 1, 2006". United States Census Bureau. Archived from the original (csv) on 2008-01-15. Retrieved 2008-09-15. ↑ 33.0 33.1 "Oklahoma, All Terrain Vacation". TravelOK. TravelOK.com. 2006-01-12. Retrieved 2008-09-15. ↑ Greymorning, Stephen. "Profiles of Native American Education Programs". Southwest Educational Development Laboratory. Retrieved 2008-09-15. ↑ "Religious Groups". pewforum.org. The Pew Forum on Religion & Public Life. Retrieved 2011-01-22. ↑ "Registration by Party as of January 15, 2009" (PDF). Oklahoma State Election Board. Oklahoma State Election Board. 2009. Retrieved 2011-01-15. ↑ "THE WEST - Events from 1500 - 1650". PBS. Retrieved 2008-09-13. ↑ "Trail of Tears". ngeorgia.com. Retrieved 2008-08-27. ↑ "Oklahoma (Indian Territory)". Civil War Traveler. Retrieved 2008-09-15. ↑ 41.0 41.1 "History of Oklahoma". The History Channel. Retrieved 2008-08-28. ↑ "Contributions of the Indian people". Oklahoma State University. Retrieved 2008-09-15. ↑ "Tulsa Area History". Tulsa County Library. Retrieved 2008-08-28. ↑ "Tulsa, Oklahoma City History". Bycitylights.com. Retrieved 2008-09-13. ↑ "1930s Dust Bowl". Cimarron County Chamber of Commerce. 2005-08-05. Retrieved 2008-09-15. ↑ "History of the States: Oklahoma, The Sooner State". The History Channel. 2007. Retrieved 2008-08-29. ↑ "Oklahoma Symbols, State Song: Oklahoma!". State History Guide resources. Retrieved 2008-09-10. ↑ Medley, Robert (2001-09-12). "Memorial draws '95 survivors Diverted plane passengers also drawn to bomb site" (NewsBank). The Daily Oklahoman. p. 6-B. Retrieved 2011-01-15. ↑ "Paper Reports Six Subpoenaed To Testify About Oklahoma - Blast" (NewsBank). The Buffalo News. Buffalo, New York. Reuters. 1997-07-14. p. A6. Retrieved 2011-01-15. ↑ "Okla. Grand Jury Subpoenas 6 In Coverup Probe" (NewsBank). Washington Post. Okla. Grand Jury Subpoenas 6 In Coverup Probe. 1997-07-14. p. A8. Retrieved 2011-01-15. ↑ Rodriguez, Alex (2001-06-11). "U.S. executes McVeigh - Oklahoma City bomber is 1st federal inmate put to death since '63" (NewsBank). Chicago Tribune. p. 1. Retrieved 2011-01-15. ↑ Talley, Tim (2004-08-09). "Nichols asks forgiveness for role in Oklahoma bombing as he gets life on state counts" (NewsBank). The Deseret News. Salt Lake City, Utah. Associated Press. Retrieved 2011-01-15. ↑ Wright, Muriel (June 1936). "Chronicles of Oklahoma". Oklahoma State University. Retrieved 2008-09-15. ↑ Merserve, John (1941). "Chief Allen Wright". Chronicles of Oklahoma. Retrieved 2008-08-10. ↑ "Land and Water Area of States and Other Entities: 2008" (PDF). U.S. Census Bureau. 2008. Retrieved 2011-01-19. ↑ "Elevations and Distances in the United States". U.S Geological Survey. April 29, 2005. Retrieved 2006-11-07. ↑ 59.0 59.1 "About Oklahoma". Travel OK.com. 2008. Retrieved 2008-08-06. ↑ 60.0 60.1 "Oklahoma's Climate: an Overview" (PDF). University of Oklahoma. Retrieved 2008-09-15. ↑ 61.0 61.1 Arndt, Derek (2003-01-01). "The Climate of Oklahoma". Oklahoma Climatological Survey. Retrieved 2008-09-15. ↑ "Tornado Climatology". NOAA National Climatic Data Center. Retrieved 2008-08-06. ↑ Novy, Chris. "SPC and its Products". NOAA. Retrieved 2008-09-15. ↑ "Oklahoma Weather And Climate". UStravelweather.com. 2007. Retrieved 2008-09-15. ↑ "Weather Averages: Lawton, Oklahoma". MSN Weather. Retrieved 2008-09-15. ↑ "State and County Quickfacts - Metropolitan Statistical Area". United States Census Bureau. Retrieved 2008-09-15. ↑ Morgan, Rhett (2008-03-27). "Stillwater's growth tops in Oklahoma". Tulsa World. Retrieved 2008-03-29. ↑ 68.0 68.1 "Oklahoma Census Data Center News" (PDF). Oklahoma Department of Commerce. July 2007. Retrieved 2008-09-15. ↑ "Oklahoma Municipal Government" (PDF). Oklahoma Department of Libraries. 2005. Retrieved 2008-09-15. ↑ Hibdon, Glenn (2007-07-29). "Pro soccer: Soccer comes to Tulsa". Tulsa World. Archived from the original on 19 September 2008. Retrieved 2008-09-15. ↑ "BA Team Valuations - #29 New Orleans Hornets". Forbes.com. 2007-01-25. Retrieved 2008-09-15. ↑ "OCIS Document Index". The Oklahoma Supreme Court Network. Retrieved 2008-09-14. ↑ "Oklahoma State Icons". Oklahoma Department of Libraries. Retrieved 2008-09-14. ↑ "Bill 1669". Oklahoma Secretary of State. Retrieved 31 January 2012. This page was last changed on 8 February 2019, at 15:21.